Secure your data with a firewall! Your web application firewall, otherwise known as WAF, will filter, monitor, and block HTTP traffic to and from specific web applications. 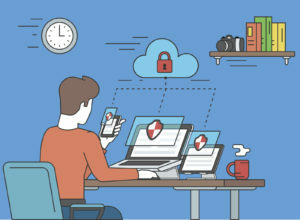 As the WAF market grows, it’s necessary to gain a better understanding of why your web applications need protection and what you can do to provide it. Here are some tips to consider for choosing the right web application firewall. The first tip for choosing the right web application firewall is to consider the type of applications that you will be defending. If they are mostly cloud-based, then you’ll benefit the most from a cloud-based WAF. On the other hand, if your applications and IT equipment are located on the premises, you’ll benefit the most from a physical or virtual WAF. Many organizations employ a combination of these two options. Therefore, consider using multiple web application firewalls to cover each type. WAFs either employ a passive or active operation. Passive mode means that the WAF is monitoring web traffic, log activity, and performing checks. Although it won’t act on traffic, it will send alerts. In active mode, the WAF will manipulate traffic by obfuscating date, blocking attacks, or redirecting workflows. Active WAFs will provide better protection from malicious traffic but may also block some legitimate traffic as well. Passive WAFs allow all traffic through without blocking users, unless the security team takes action against any identified threats. Your WAF will collect data about policy details and events that get logged. It’s likely that your organization has an established preference about how much visibility and control they want over the data. With that said, for complete control, you should choose a web application firewall that can be deployed as a physical or virtual device. A cloud-based WAF also provides a high level of visibility and data control. The lowest visibility and control on the list comes from a SaaS-based WAF. A big consideration that will help you choose the right web application firewall is the amount of time and resources you have available to manage the system. If you opt for cloud-based or SaaS-based options, professionals offsite will be managing the infrastructure for you. With physical devices located on the premises, you will be responsible for the management. In that situation, you’ll need to allocate time to perform updates, patches, and other forms of management. Both types will require regular technical adjustments that will ensure your WAF matches the security requirements of your organization. This entry was posted on Friday, May 25th, 2018 at 1:47 pm. Both comments and pings are currently closed.